I have just finished my part of the areas annual Christmas Bird Count. It is a national event that happens the last two weeks in Dec. This area, the northeast metro, does it on a Sat between Christmas and New Years day. I have been doing this for over twenty years. My charge is to watch my bird feeders all day and report my sightings. It is always interesting to see what types of birds I see. The key is to watch the feeders and surrounding area as much of the day as possible. Today I had a Robin and a Cedar Wax Wing that were here only for a moment. Had I not been watching I would have missed the sighting. The count is based on how many birds are at the feeders at any one time. There was a Barred Owl near the feeders two days ago, and I heard it hooting before it was light yesterday morning. I don't know if that can be in the count or not. The last season brought some things that no one around here had seen before. 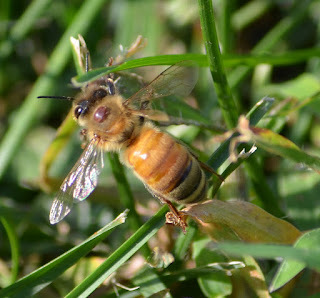 Winter of 2011 - 2012 was the warmest for wintering bees that I have ever seen in almost 20 years. The warm winter made overwintering bees a cake walk. It seems that if the bees had 40 lbs of honey they were able to survive. Most queens starting laying early in January. The only cold spell we had was in Feb for about three days. 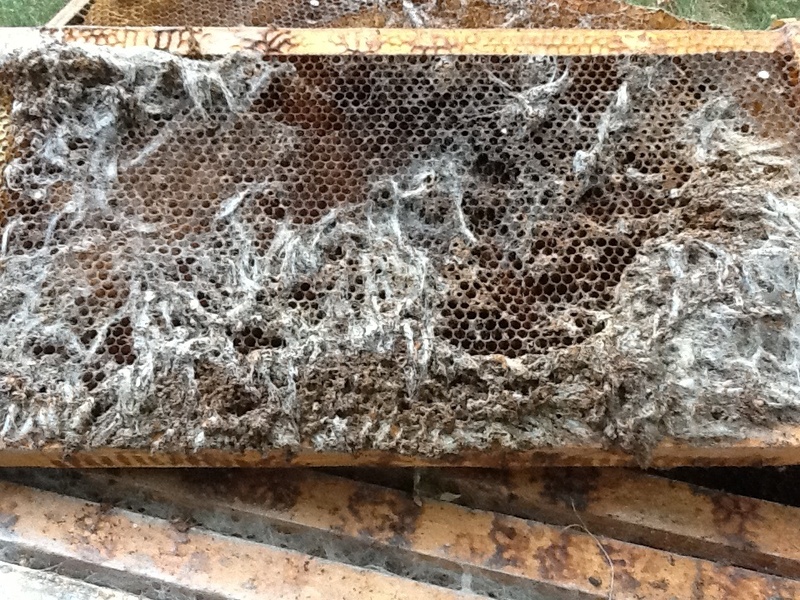 This did kill a few colonies caught with no honey and brood on the frames. Starvation still was an issue in colonies that went into winter short on stores. Early feeding saved many colonies. The early laying put populations on a steady rise. By March colonies were building up nicely. Pollen patties were being devoured at a steady clip keeping the spring build up on course. Late March and early April there was natural pollen coming in. April put colonies three weeks ahead of schedule. 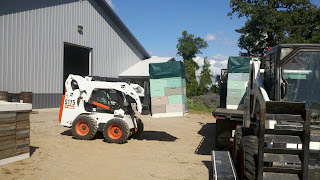 Package bees arrived on schedule and the weather proved nice to install them and get the bees up and running. Dandelions were coming out in mid April around the metro area. The fruit bloom started in late April with apples finishing in the first week of May. A hard frost hit in early May severely damaging the fruit crop in MN. The early fruit bloom left many colonies with no pollen coming in for three weeks in May. This dearth in pollen contributed to swarming, queen laying issues and supersedure. Beekeepers that put on pollen patties saw the bees gobbling them up. Swarming started becoming an issue in late April. Overwintered colonies began bursting at the seams. This caught many beekeepers off guard. Swarming began early and went on into June. Colonies were being divided three weeks earlier than normal starting in late April into early May. Luckily queens were available for most of the divisions. Package bees progressed nicely through May into June. The main nectar flow started three weeks early around the first of June. 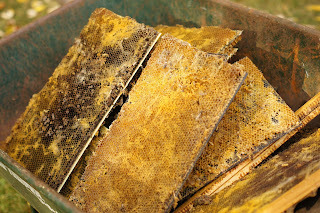 Overwintered colonies that were strong began packing the honey away. Package bees still had not fully developed yet and were not able to reap the nectar at this time. The weather was fine and moisture was ample. Overwintered colonies put away large amounts of honey around the metro area. Beekeepers in the north had to contend with large rainfalls and beekeepers south of the metro had drought conditions to deal with. 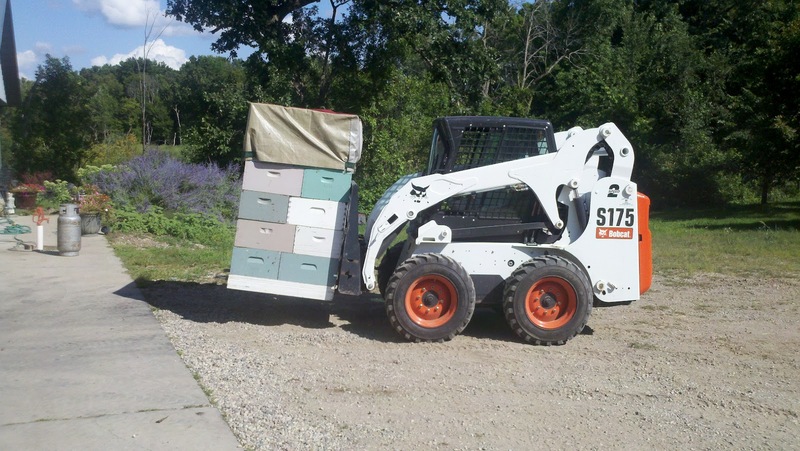 Wisconsin beekeepers had very dry conditions that contributed to a poor nectar flow. Minnesota beekeepers in the central part of the state heading straight into South Dakota had a good to very good nectar flow. The nectar flow was steady through the first three weeks of June then the weather dried up and so did the nectar for many of us. Package bees were up and ready to go by then but the dry conditions kept the nectar flow at bay. July came and the dry weather continued. Swarming came out again keeping swarm chasers busy for a long swarm season. 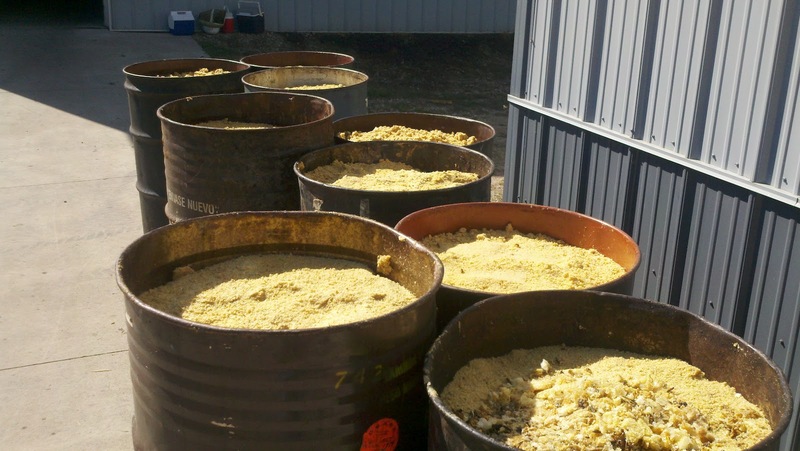 The crud was in many bee colonies across the country. This was probably a virus. Luckily the crud responded to a couple of treatments of Terramycian. August did produce some Goldenrod honey for many colonies. 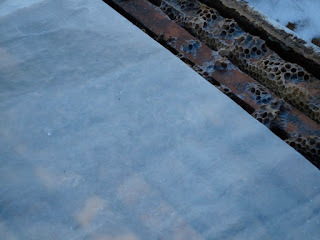 The honey did have a higher moisture content than the June crop had. Sept did prove a surprise. Being that the over wintered colonies had an early build up, mites started to rear their ugly little heads. Mite treatments were going on over the the fall months. Some colonies experienced mite damage in August. Mite treatments applied in Sept and October on these mite damaged colonies proved ineffective as the bees started to abscond in late Sept and Oct. Mite damaged colonies were too far gone to save. 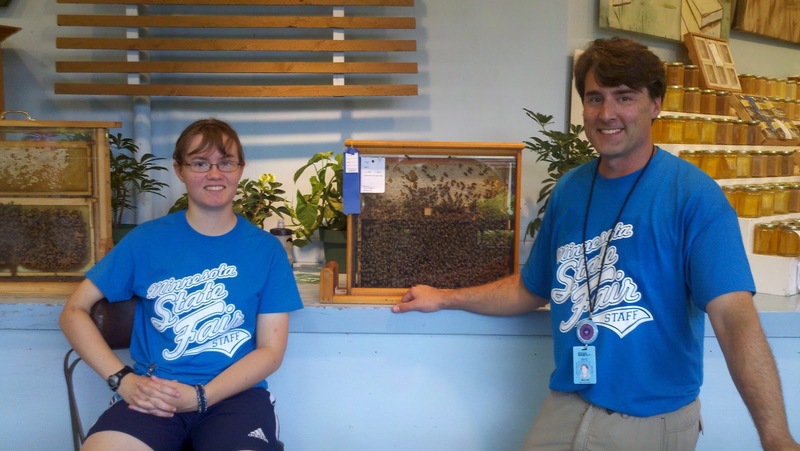 Beekeepers that treated in August had good luck keeping the mites in check. The mite build up in packages was mixed. Some packages needed treatments but most seemed to have lower mite counts. Winter stores in many colonies were light. Feeding went on through the fall. Beekeepers that fed early were able to get ample food in their hives. Cooler weather made late feeders struggle to get their colonies up to proper wintering weight. They had to resort to putting on candy boards or feeding dry sugar. Late fall weather was warm even into December. The warm fall made for low consumption of winter stores that will hopefully bring the bees through winter. While the last year was challenging with the weather most of the bees are in great shape and with a little luck and a normal winter, 2013 looks to be a good one. Apivar is a new mite treatment has become available in the U.S. The active ingrediant is Amitraz. This mite treatment has been available in Europe for a long time. I don't know anything about cost or availability at the moment. It is now approved for use in the following states at the moment, SD, OR, ND, CO(*), MS, MN, CA(*), FL, MI, AR, KY for 2012. Apivar are contact strips that are inserted into the hive and hang between the frames. It is effective on Varroa and Tracheal mites. I have been getting calls about package bees. 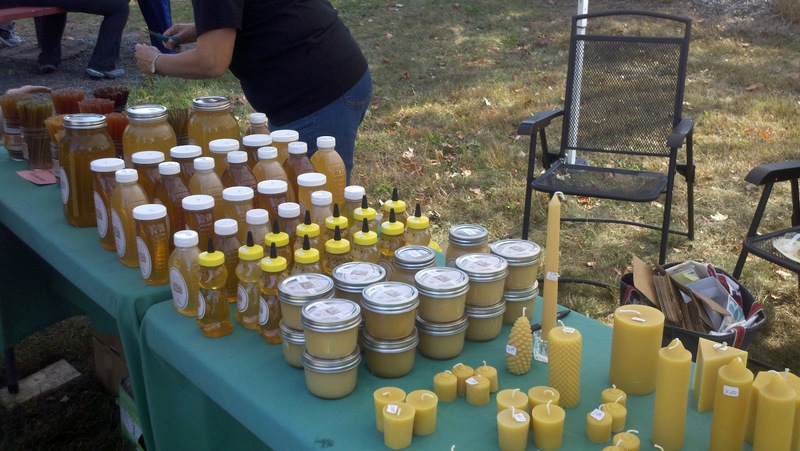 Beekeepers have been asking when orders will be taken for the next spring season. I should have my 2013 pricing for bees in late Jan. 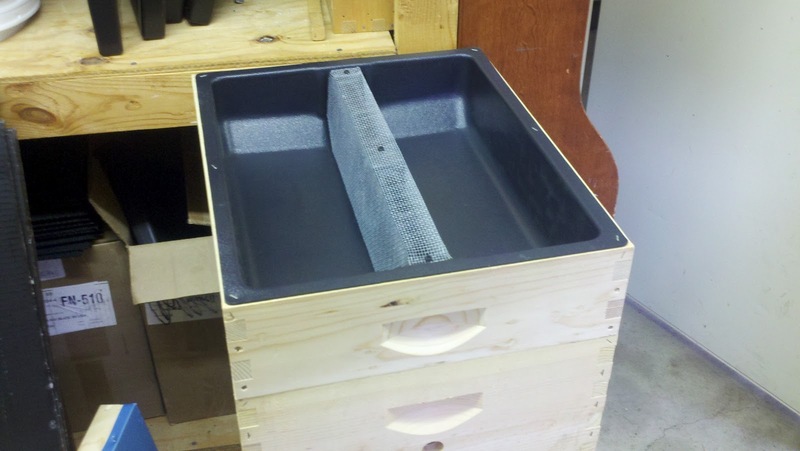 This is a honey melter that a local beekeeper came up with. It works for him. He took a cooler added a light bulb on the lid. 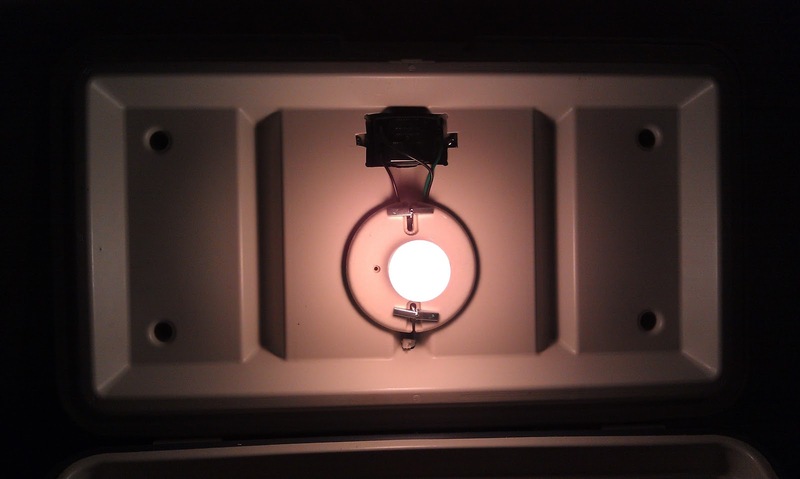 He uses a 40 watt light bulb wired into a dimmer switch. 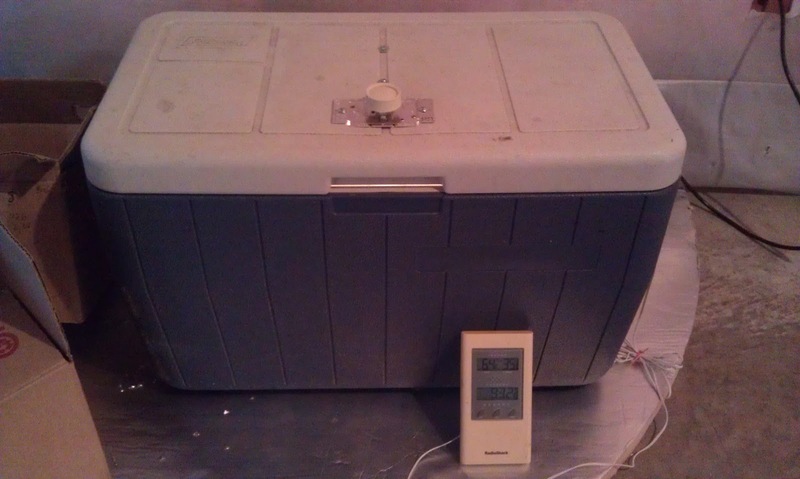 He also uses a indoor/outdoor thermometer to measure the temperature in the cooler. 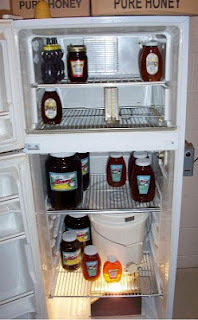 He says when the temperature reaches 100 degrees the honey is usually clear. There is so much mass of the honey in the jars absorbing the heat it takes a while to get to that temperature. As always, all wiring should be done by licensed electrician. Safety from fire is always a number one priority. 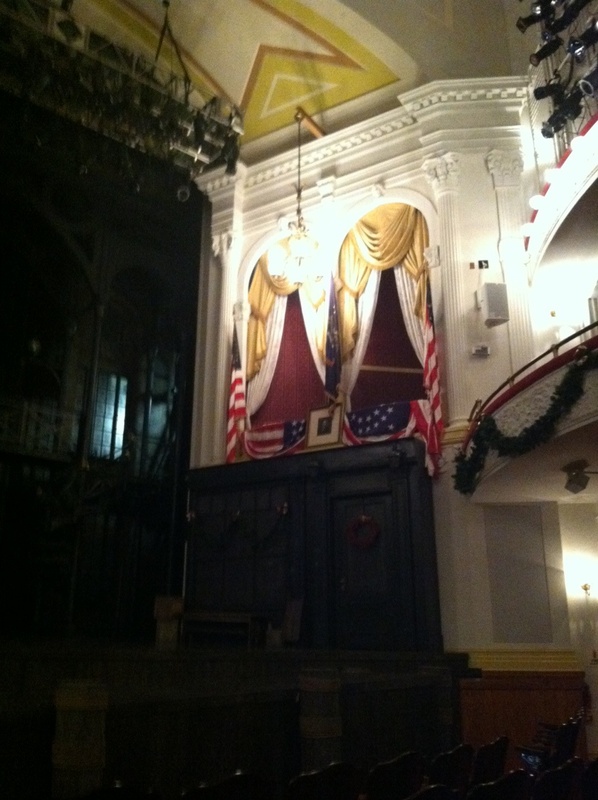 Photo by R. Schultz - The honey is on a grate. 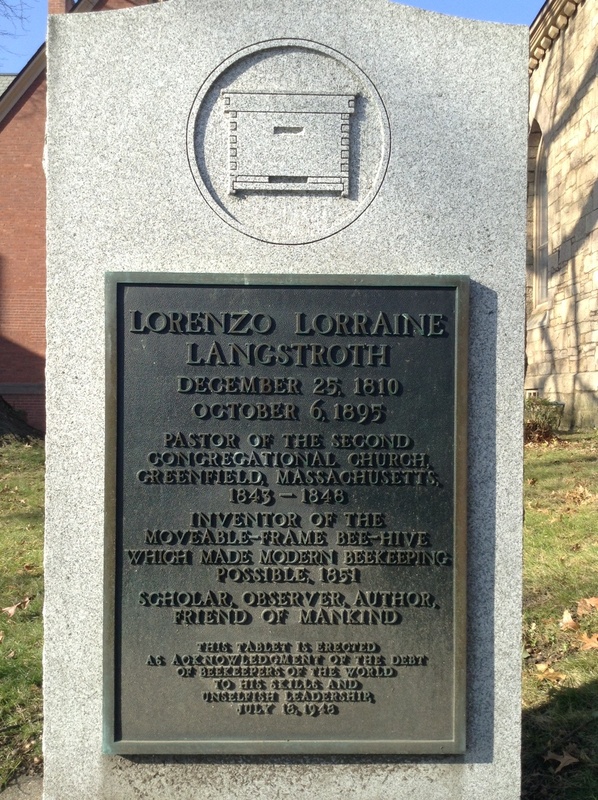 Photo by R. Schultz - A indoor/outdoor thermometer monitors the inside temperature. 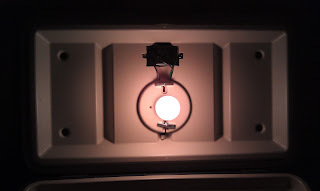 A dimmer switch on mounted on top. 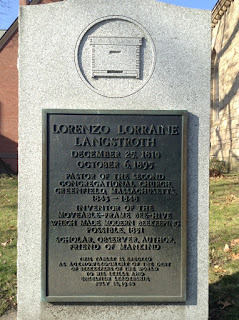 Photo by R. Schultz - The lamp is mounted on the lid. 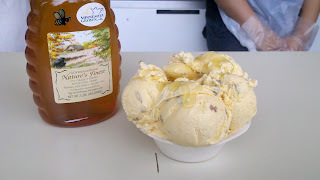 Creamed honey should be made by the end of this coming weekend if it is to be properly set by the holidays. I made 60 lbs of Cinnamon Creamed Honey this weekend. Two pails of honey that was just liqufied. It was a little too warm for adding the creamed honey seed. It had to let it sit and cool down to 95 degrees before I added the seed. 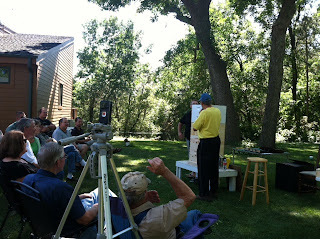 The honey that I used was from western MN, the supers had a mixture of yellow sweet clover and sunflower honey. The moisture content was 14%. Even when the honey was warm it was very thick to stir. The seed was added when the honey cooled to 95 degrees. I couldn't find the seed I normally use at the grocery store. They were all sold out. Too many beekeepers making creamed honey this weekend I guess. I had to try another brand, I hope it works out. After I stirred in the seed, the honey was a consistent color throughout. I then stirred in the cinnamon powder. After that was all stirred in and thoroughly incorperated I set it outside to cool down quickly. Of course I forgot it was on my deck and left it out all night. I brought it in in the morning. I checked it several hours later after it had warmed up. Low moisture honey and cool temperatures kicked everything into high gear. The honey had all ready started to set. 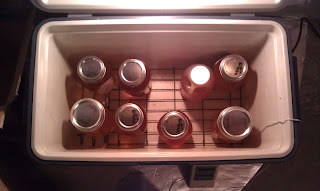 The jars were prepared and I started to bottle the honey. 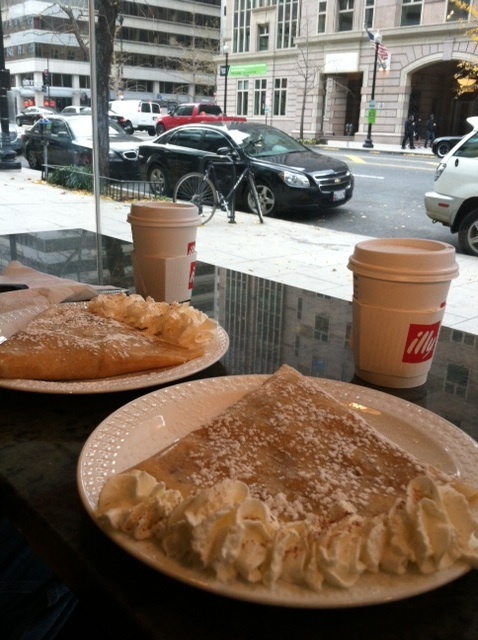 The consistency was already very thick and the pouring was slow going. Normally some of the cinnamon powder would have floated up to the top and would have to be skimmed off before bottling. With this thick honey all of the cinnamon stayed suspended and there was nothing to skim off. Hex jars were used for the bulk of the creamed honey, several plastic cups were also in the mix so I can tell when the creamed honey is set by squeezing the sides of the plastic containers. I think it will be ready by Friday. Some of my colonies still need feed. The next week looks good for feeding. Next weekend looks cold. The colder it gets the harder it will be to get the bees to take the feed down. I am going to get out tomorrow and load up the colonies with syrup. 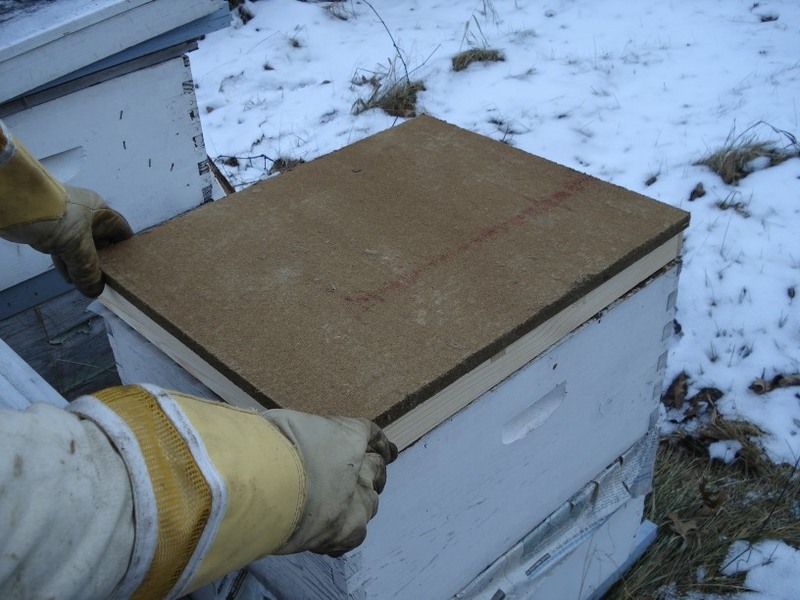 The colonies that don't get fed will get a treatment of Mite Away Quick Strips for Varroa. Submit a public comment before the deadline on Monday urging the EPA to stop stalling, and take action to protect bees from the harmful pesticide clothianidin. Deadline Monday: Tell the EPA to save the bees. The sudden bee die-off known as colony collapse has claimed about 30% of the U.S. honey bee population each year since 2006. Scientists believe the pesticide clothianidin is at least partially to blame, but twice in the last year, the EPA has refused to intervene to review the pesticide's safety. If we don't convince the EPA to reconsider, it will not review clothianidin again until 2018. By then it could be too late for the bees, and the one third of our food crops that bees play a crucial role in pollinating. The EPA is currently accepting public comments on its latest decision not to declare bee die-offs an emergency situation and suspend the use of clothianidin. Now is a crucial moment to make our voices heard for the bees. Tell the EPA: Stop stalling. Ban the pesticide that's killing bees. Submit a public comment to the EPA now. The pesticide, which is used to treat seeds like corn and canola, expresses itself through the plants' pollen and nectar — the honey bees favorite sources of food. Neonicotinoid pesticides are relatively new, and their use coincides with the rise of colony collapse. Astonishingly, clothianidin was approved by the EPA based on virtually no scientific study.2 Yet the EPA continues to allow its use. 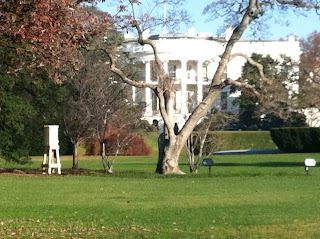 Thanks for taking action for the bees, and safe food. I do have moisture boards available. 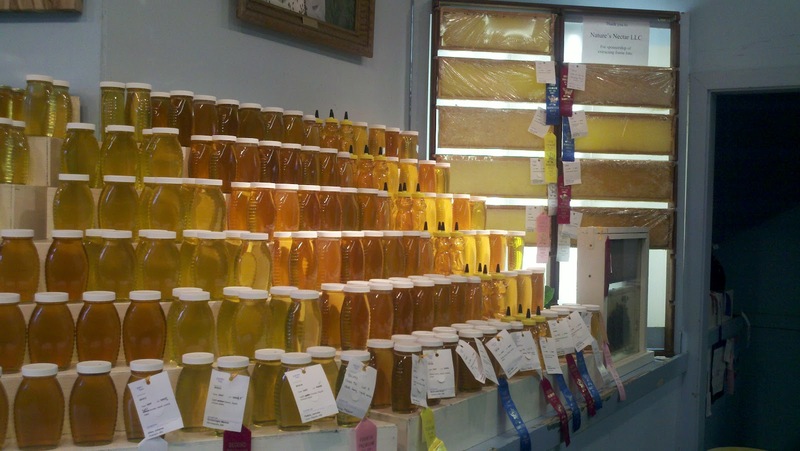 How the honey is displayed, extraction, live bee display, types of entries will change, how the whole display is in general is going to change. Everything is on the table. Any ideas to Dave is appreciated. The time is short so comments need to come soon. People should direct their suggestions to dschaaf@gmail.com before this Saturday. At the same time the building is renovated, the Ag-Hort superintendents are being asked to re-evaluate and update their exhibits. There are good reasons for this. The Ag-Hort building has remained static for some time. The State Fair directors understand that to attract visitors they need to keep the Fair interesting, relevant, and current. Our audience has changed. The overwhelming majority of State Fair visitors are from the Twin Cities with no direct experience with agriculture. 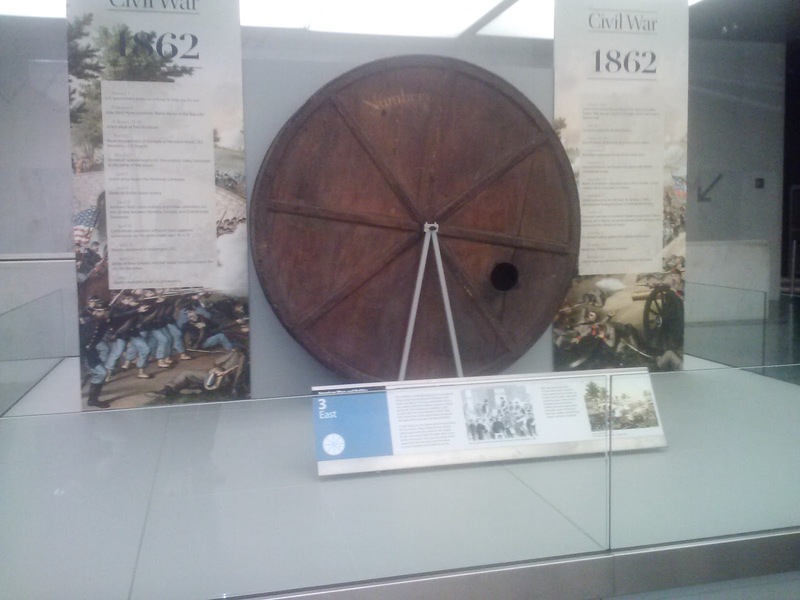 We're being asked to make our exhibits more educational with this particular audience in mind. 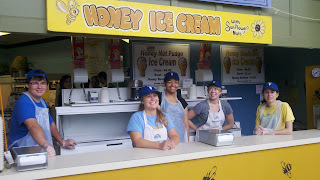 Having just completed my first State Fair as Bee & Honey Superintendent, I have a better appreciation than ever of the rich history of the Fair, and the special place Bee & Honey occupies. The efforts of many talented and dedicated people have built our Bee & Honey Show into one of the leading honey promotions in the nation. I'm proud to be carrying on this tradition. At the same time, I'm excited about the possibilities ahead. We have a unique opportunity to raise our standing at the Fair. I'd like Bee & Honey to be as iconic and sought after at the Fair as seed art and butter sculptures are now. I'd like to bring our message to a wider audience. This is our chance to take the show to the next level. We're brainstorming now. Winnie Johnson has collected some of our ideas (attached). This is an early draft and doesn't include our most recent ideas and changes. Don't be startled by some of the things proposed. Remember we're just brainstorming. We're trying to propose big ideas. It remains to be seen which ones will be accepted and implemented. If you have any more ideas or suggestions I'd love to hear them. No idea is too big or far fetched. I need your ideas by Saturday Sept 22nd (sorry, not much time). I'll be revising the proposal this weekend and submitting it to the Fair on Monday Sept 24th. The Ag-Hort superintendents will meet sometime in October to go over everyone's proposal and get the process started. It's going to be interesting. I'll keep you updated. Thanks for your input and for your ongoing support of the Bee & Honey Show. 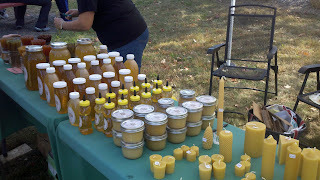 My table of honey and beeswax products at an Apple Festival. Wax moths webbing and larvae have wrecked this frame. Wax moths can be a hassle. They usually go after dark combs eating pollen and protein rich wax. They spread their webs across the combs and leave it a mess. 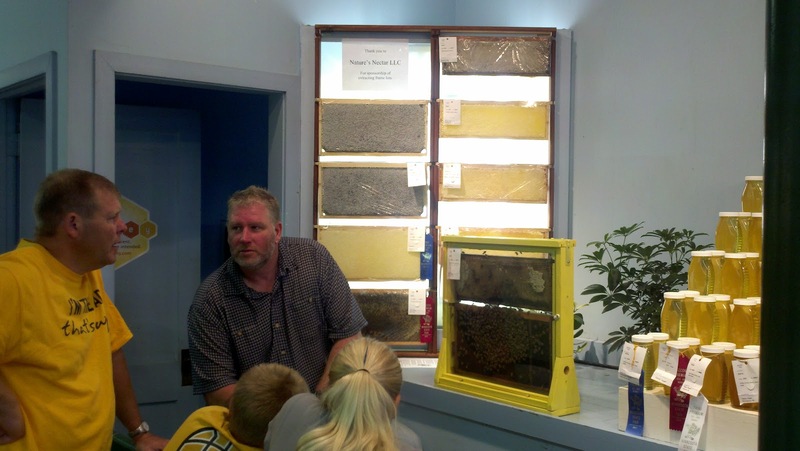 A beekeeper ends up replacing all the comb with new foundation. Wax moths are a problem in MN from mid June until it starts cooling off in Sept. The only method of control is Para - Moth. The Para - Moth is put on top of a stack of boxes on newspaper and the stack is closed up. This will repel the moths from getting into the stack of boxes. Putting the frames in the freezer for a few days is also good control, if they are caught early on before the wax moths get to far on the comb. Freezing temperatures kills the moth in all stages of development. Mothballs are not acceptable for wax moth control. As it gets cooler in Sept and into late fall wax moths have a hard time getting going in hives. 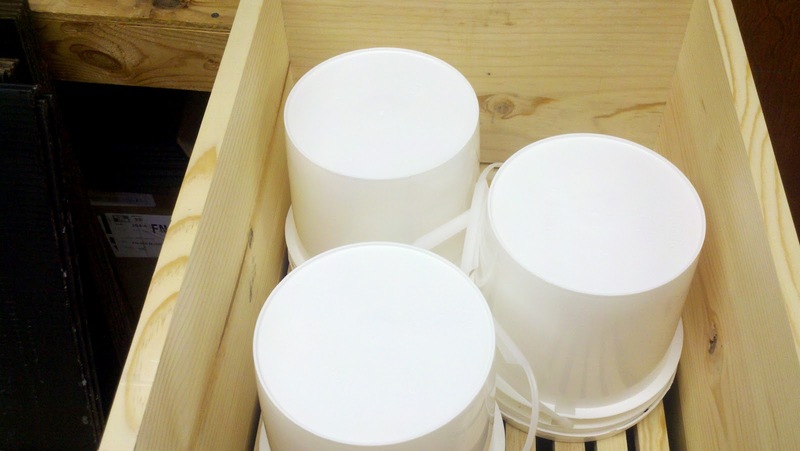 Storing equipment outside in freezing weather will kill the wax moth. Storing equipment in an attached garage may prove to be too warm and the moth may continue to do damage. It looks like we are about to be slammed with some refreshing fall weather. Now is the time to put in entrance reducers to keep the mice out. I always put mine in the widest opening. It is too early for winter covers. I wouldn't even think about putting on the winter wraps until at least Nov 1st. Personally my covers go on Thanksgiving weekend, unless we are going to get dumped on with a snow storm. 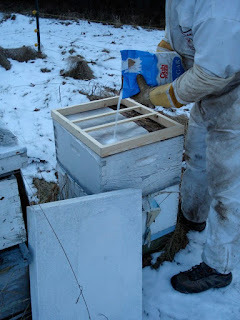 Feeding can still go on now, but as it gets colder the bees won't take the feed as well. So feeding as soon as possible is always the best bet. Several mite treatments are temperature sensitive. Apiguard and Mite Away Quick strips don't work well at all when daytime temperature stay in the 60's. The best option for this colder weather treatments is Hopguard. Tuesday is going to be 92 degrees. 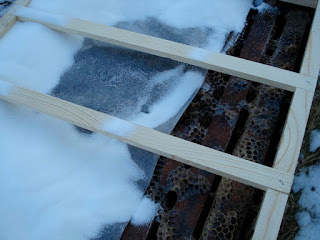 A perfect temperature to pull honey using a fume board with Honey Robber or Fishers Bee Quick. 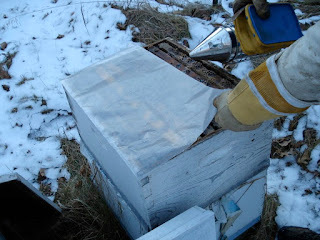 The warm temperature will make the bees leave the supers quickly. The nectar flow is over for most of us. The Goldenrod is waning and has lost its golden luster. Most beekeepers are pulling honey now or in the very near future. Colonies have been looking good with nice hive populations. Mite levels on overwintered colonies have been very high and most need to be treated if they are going to survive the winter. New package bees installed in the spring, mite loads are mixed, many have had small mite loads, some with higher mite loads need to be treated. 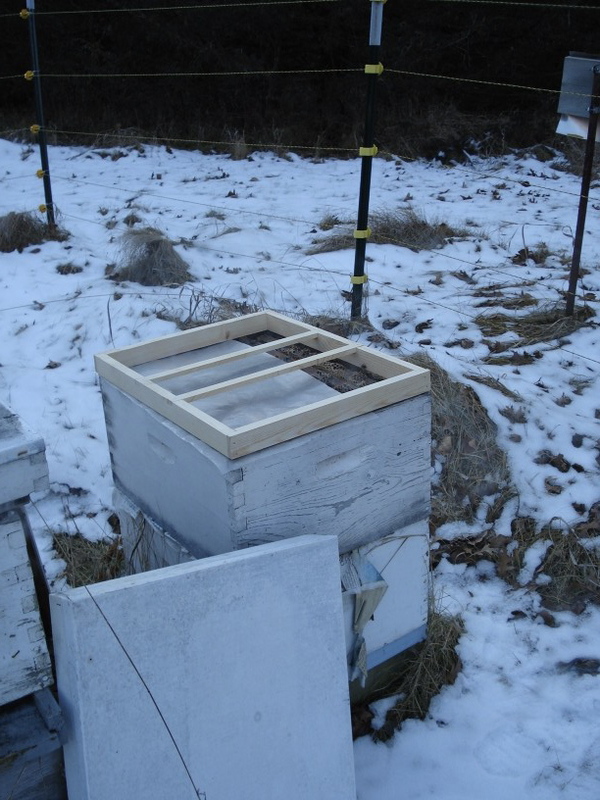 Some beekeepers have told me that their hives are heavy with winter stores while others say they need to get their hives up to wintering weight. The top box should have 8 full frames of honey and one partially full frame located in the center. 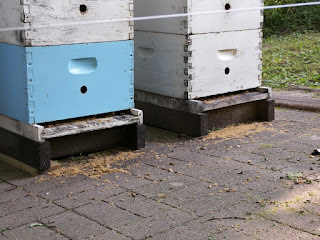 Some beekeepers did a reversal too late in early summer and put the heavy box on the bottom, this heavy box needs to be on the top. Middle box on a three high hive or the bottom box on a two high hive should have four frames of honey. Two on the outside on either side. Bottom box on a three high hive should have two frames of honey one on each side on the very outside of the box. Do not leave a partially filled box of honey on top of the hive. The bees may move up into it in late winter and starve, even though there is honey below in the lower box. Feeding is going on now. Some mite treatments make it hard to feed, others can be done at the same time. It is a good idea to get the feeding done as soon as possible. Feeding spurs the queen to lay eggs because it is an artificial nectar flow. Brood has a 21 day schedule from egg to emerging bees. So feeding should be completed by Oct 10th if possible. The goal is to have the bees shut down brood production before winter sets in. If brood is present late into early winter, the bees will consume more of their food stores keeping the brood warm. This can lead to late season starvation. The dog was going crazy tonight. I thought it was a deer. Until I saw the varmint. He climbed a tree right next to my trail camera and went to sleep. 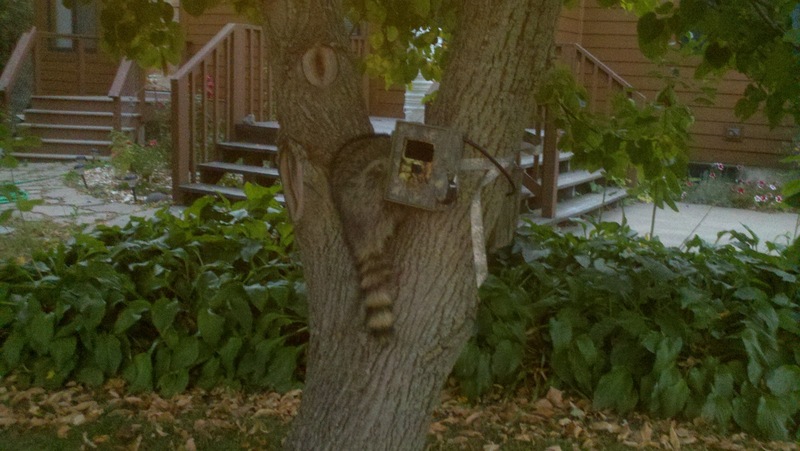 I couldn't get the SD card out of it to see if I got his picture. 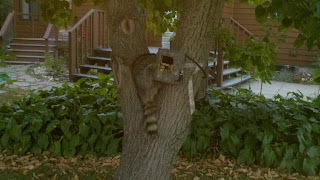 I will check the camera tomorrow if the varmint moves along. Tedd from Lake Elmo extracted his honey two weeks ago. He put his supers back on for the bees to clean up. The bees wound up refilling them with Goldenrod honey. The Goldenrod flow seems to be spotty around the area. 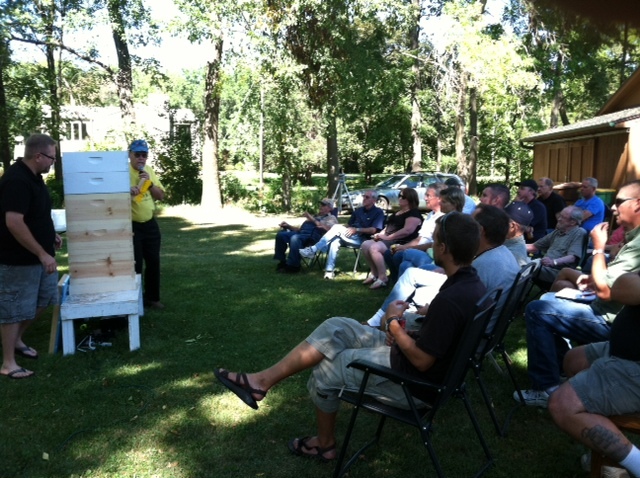 Some beekeepers getting a super of it, other beekeepers not much. The moisture content of the Goldenrod honey seems a little on the high side. I did check some Goldenrod honey today, the super was fully capped but the moisture content was still 19%. US grade A is 18.6% or less. 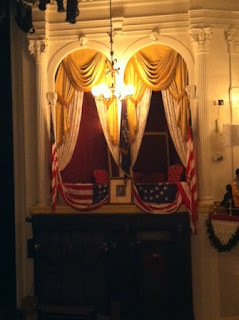 Dave Schaff on right did a great job putting this all together. High participation this year. Congratulations to all beekeepers who entered. They all helped promote the honey industry. The state fair ice cream booth has the best honey ice cream sundaes. Honey ice cream with sunflower seeds topped with honey. mmmmmm honey ice cream sundae. 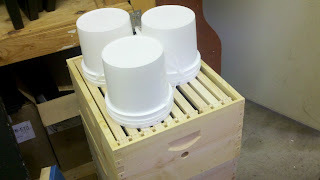 Three feeder pails on a hive. The empty deep surrounding them protects the hive from robbers. The inner and Tele covers are placed on top of this box. Feeding like this is only done in late summer. Hive Top Feeder, The bees come up from below through the center openings. They travel down to the syrup level and feed. They then transfer it to the hive. 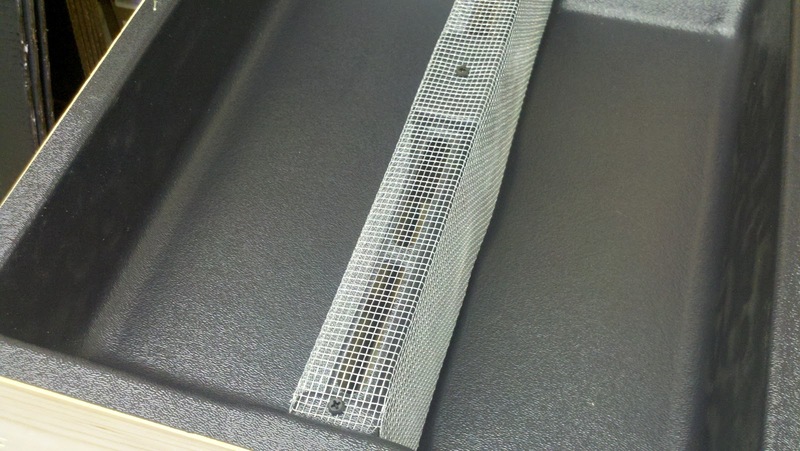 The inner and Tele covers are placed on top of the feeder. I have a colony that is noticeably light on food stores. I can not depend that a nectar flow will come along and save my bacon. Now is the time to feed a colony that is not up to winter weight and needs quite a bit of food to get there. My options are sugar water or ProSweet®. Both will work but my option with ProSweet® is that the bees don't have to convert it to honey. The bees put it in the cells and they are done. Sugar water on the other hand, the bees have to convert it to honey and dehumidify it. Taking time and energy. ProSweet® doesn't ferment and sugar water may. Feeders are another factor. I want to get as much food in the colony as fast as I can. If it cools off the bees won't take the feed as well as if the temperatures are in the 80's. Putting on multiple feeder pails works. This time of year the pails can be put directly on top of the frames. I can fit 3 feeder pails on top of the hive this way. The other feeder I use only in the fall is a hive top feeder. This feeder holds 4 gallons of feed. It is placed on top of the top brood box. The inner cover and Tele cover go on top of the feeder. Hives this time of year have large populations and can drain a feeder in three to four days. So as I feed, checking the feeder every four days helps keep the feeder full. 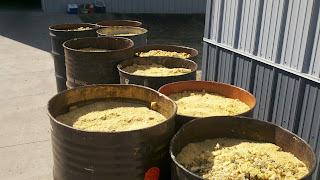 This type of feeding can really put the weight on the colony to help assure proper hive food stores heading into winter. Dan of Elk River area says his beeyard stinks. He is getting some Goldenrod nectar. I have not had any in Stillwater yet. Adrian of Hudson, WI told me Friday that he is getting a trickle right now. Maybe the warm weather has kicked in a nectar flow. There is a reading of the proposed bee ordinance Tues Aug 21st, 7 pm Stillwater City Hall. This is the first of two readings before the ordinance can be adopted. 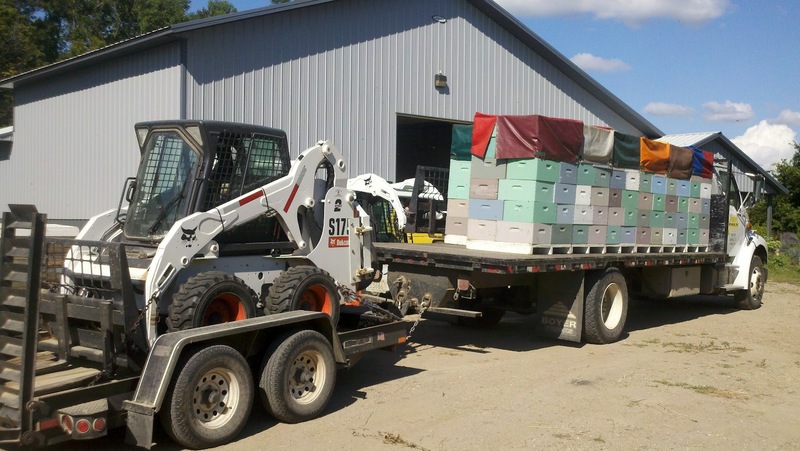 Several beekeepers have been moving this ordinance through the process since spring. Currently beekeeping is pretty much banned in Stillwater. The new ordinance if approved will give residents the opportunity to keep bees in the city. The extracting workshop went very well today. Master Beekeeper Bob Sitko and Beekeeper Mike Wybierala wowed the crowd with their knowledge of pulling honey, treating for mites and wintering bees. I had the novice beekeepers in my honey house using the hot knife, extracting honey, filtering honey and bottling honey. 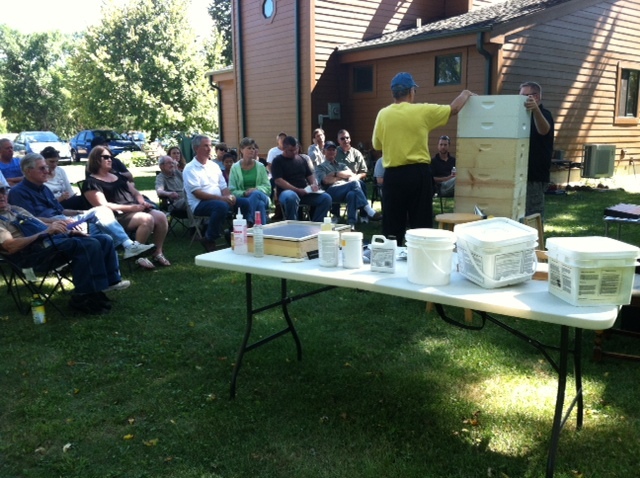 Everyone had a great time and hopefully will be able to put the information learned to help them extract their honey. Now that summer is coming to an end Varroa is starting to ramp up. Many beekeepers I have talked to have started seeing mites on the bees. Usually when the mites are visible on the bees there is a high mite load in the colony. Now is a good time to check the mite load on colonies. Here is a link to the Univ of MN. Poster 155 checking for Varroa with the powdered sugar method. If the mite numbers are high and mite treatments are necessary, there are several options and some are considered food additives and very bee friendly. HopGuard is from the hops plant. Treatment is 2 strips per deep per week for a three week period. Strips can be put on at any time. MiteAway Quick Strips Formic Acid, they are a one week treatment. Strips can be put on at anytime it is 85 degrees or less. Works best in the 75 - 85 degree daytime temperatures. Apiguard, thymol gel - supers have to be off, fall treatment only. Two foil gel packs on top of colony. One month treatment, one foil pack, two weeks later add the second one. Daytime temperatures should be in the 70 - 85 degree range. All of these mite treatments need to applied according to the label. Always follow manufacturers guidelines when using any mite treatment. Keeping mites low helps winter survival of the colony. Tell the EPA to stop stalling on the removal of Neonicotinoids from our environment. Save the bees. Load of deep honey supers. Each box has about 90 lbs of honey if they are full. Bobcats are used to load and unload trucks. 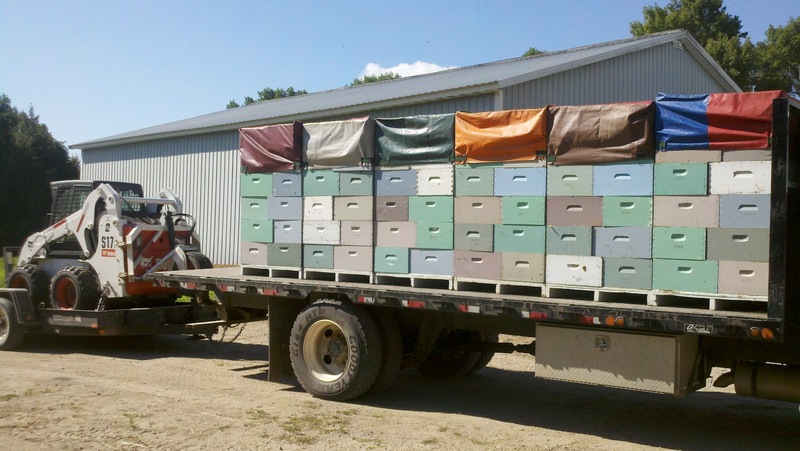 On the top of the pallets are canvas covers that strap down tightly on the supers to prevent robbing of the honey while the truck is being loaded and unloaded. I visited a commercial beekeeper last week. They are in the middle of extracting. 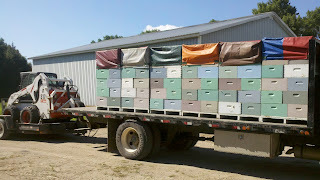 Their truck goes out daily and pulls honey beeyard to beeyard. They use fume boards with honey robber. After a dismal year last year, the current year is a huge honey crop. All of their deep supers are heavy with honey. The honey is a very light in color with a low moisture content. In a good year many commercial beekeepers produce between 500,000 and 1,000,000,000 lbs of honey. Honey prices are up so they should fare well this year. I have started to see Goldenrod blooming around the metro. The field across the street from my house has yellow color starting to open up. With any luck my hives should be stinking like wet sweat socks shortly. That will tell me the Goldenrod is producing nectar. The Goldenrod seems very abundant this year. My hives seem to be congregating at the front door. That tells me there may be not much nectar coming in at the moment. I was driving in western Wisconsin yesterday and noticed a farmer cutting his 3rd hay crop of the year. There is still time for the hay to grow and flower one more time. If the farmers don't cut it there may be some late clover for the bees to get the weight up for winter. The drought that is gripping a large part of the nation will be seen by beekeepers starting late this year. The corn crop has taken a major hit. Even E-85 fuel will rise or possibly be curtailed in the short term so corn can be used as food. The smaller corn harvest will more than likely lead to higher sugar prices. Feeding bees will become more expensive. As corn prices go up so will the price of high fructose corn syrup (HFCS). 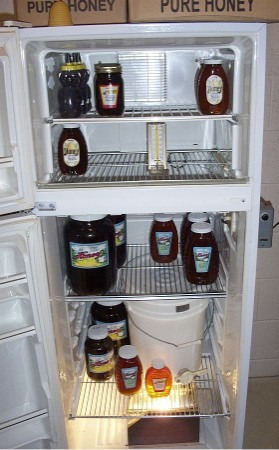 Many beekeepers feed their bees HFCS and will incur higher costs. The price of sugar will also rise. Even though the sugar beet harvest to my knowledge hasn't been impacted by the drought, the higher HFCS prices will drag the price of sugar with it. 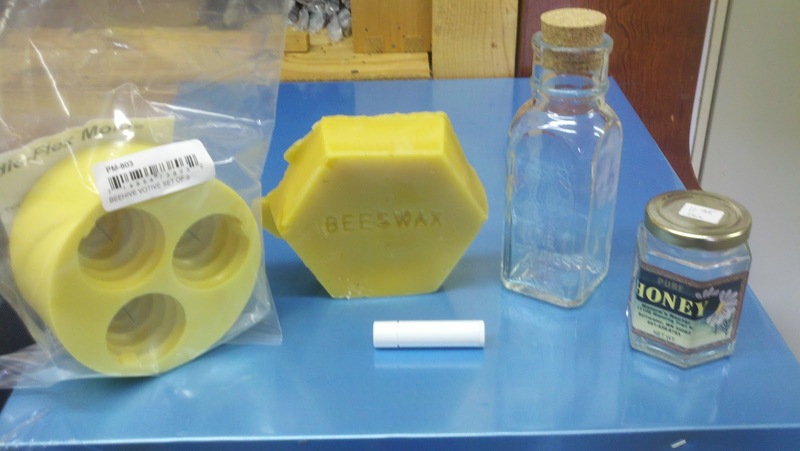 Many bee suppliers of HFCS buy contracts of thousands of lbs of HFCS for a set price. Once the contract is satisfied a new one is negotiated. This new contract will undoubtedly be a higher price. As a hobby beekeeper buying some extra sugar is not a bad idea. Long term storage of sugar can make the sugar get hard and difficult to liquify. ProSweet does have an advantage that it will not granulate for at least a year and will store nicely. The silver lining in this all is that the price of honey will also rise. Hopefully the higher honey prices will more than offset the sugar shock that beekeepers may see down the road. 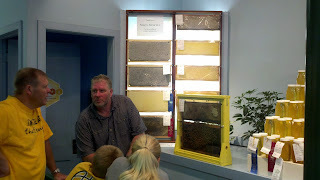 What: Discussion about methods of pulling honey, mite treatments, wintering bees with Master Beekeeper Bob Sitko and Mike Wybeirla. 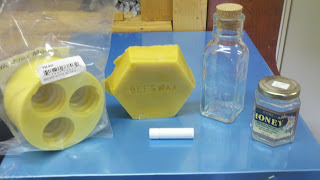 Hands on workshop with Jim: you will uncap frames with hot knife and capping scratcher, extract honey with three frame hand crank extractor, and bottle honey. The workshop is limited to 50 people. Please call or email me to reserve a spot. Due to limited space and bees in the honey house small children will be happier at home. The honey season is on the home stretch. This is the time for beekeepers to pay attention to their supers. I always make sure there is an empty super on the hive. The bees will collect nectar as long as there is a place to put it. When I pull honey off the hive, if any colony has all the supers full I know I left some honey in the field. It is always best to pull off an empty super, then I know I was able to get all the honey the bees had the ability to collect. After the honey is pulled there will be some uncapped honey. But if the honey has been on the hive for a couple weeks the bees have usually ripened it. The only reason it isn't capped is because the cells were not full. As a precaution I always extract the frames of 50% or more uncapped honey separately and moisture check them to make sure the honey is 18.6% or below. I am working in the Chaska area for my day job. Driving home I have seen Goldenrod starting to bloom in that area. Goldenrod can be a great nectar source for bees. Last year the nectar flow in the upper midwest was very poor. On August 10th last year, many colonies of mine had not put up any excess honey. I left the supers on and came back a month later. All of my colonies had at least one super of Goldenrod honey, a few colonies had two supers. Then there was a frost and the nectar stopped coming in. This year the Goldenrod is a little early. If the nectar is not flowing in large quantities it will be dark. But if the nectar flow is heavy the honey is a much lighter in color. When Goldenrod nectar is being collected, it is easy to tell by standing next to the hive. The hive will have a stench of wet dirty sweat socks. As the honey ripens the rank odor leaves the hive and a pleasant tasting honey is left in the comb. The early arrival of Goldenrod should eliminate any frost kill. Beekeepers will be able to get the full bloom and the golden nectar. I hope everyone's hives will be stinking up their beeyard in the near future.